How do I test my memory or RAM for errors in Windows? Failing memory can cause your PC to act in strange and unpredictable ways. Faulty memory can cause programs to crash, your system to freeze, and the occasional blue screen of death. Luckily, Windows 7 and Windows 8 (a download is available for Windows XP) come with a built in program to check your memory and diagnose what problems you may be experiencing. RAM may not be very expensive to replace, but running a quick memory test should be your first step. While later versions of Windows come with a built in tool to test memory, if you’re using Windows XP, you will have to download Windows Memory Diagnostics Tool from the internet. Unfortunately this program is no longer available from Microsoft’s website. However, a similar program is available for free download from Softpedia.com. Windows Memory Diagnostics Tool from Softpedia.com. An app to burn a bootable CD (CDBurnerXP works great for this). Your first step is to download the Windows Memory Diagnostics Tool. It is not longer hosted on Microsoft’s website, but you can find a working copy here. You’ll notice that the download isn’t an .exe file. The file you just downloaded is a .iso disc image. An .iso file is simply a file that is an image of a CD or DVD. That is to say, it is a copy of a disc the contains the entire contents of a CD or DVD in a single file. Before you can use this file we need to download some additional software. To use this file, you must create what is known as a bootable CD. A bootable CD is a disc which a PC can load on startup the same as it would Windows. While there are many programs which can create a bootable CD from an .iso image, CDBurnerXP is free and works great for this purpose. Download a copy of CDBurnerXP. Launch the downloaded file and follow the installation instructions. Launch your newly installed version of CDBurnerXP. Place a blank CD into your disc drive. Select the Windows Memory Diagnostics Tool .iso file. One final step is required before you can use your newly created CD to run a memory test. You must change your PC’s boot sequence in your BIOS menu. This may sound difficult and confusing, however it is a fairly straightforward process. When your PC restarts, you should be prompted to press a key to bring up a setup menu. Typically this key is F12 or DEL. Press this key to enter your BIOS menu. In your BIOS, find your boot sequence menu. This may be labeled as Boot Order Boot Menu, Boot Sequence, or something similar. Move your CD/DVD drive to the top of the boot order. This will make your PC look for a bootable CD before trying to boot into Windows. Now that you’ve created your CD and your PC is configured to run from that CD, it is time to begin your memory test. Place your bootable CD in your CD drive. Your PC will boot from the disc in your CD drive. 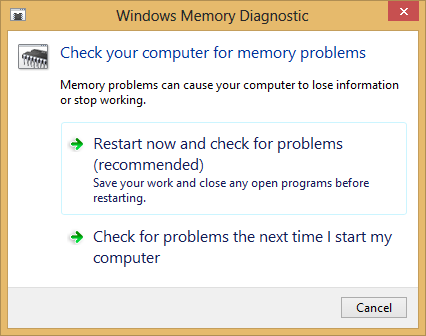 Windows Memory Diagnostic will run automatically and begin scanning your memory for faults. After running the scan, the tool will tell you if the scan succeeded or failed. In this menu, you PC may be able to tell you which memory module failed and needs to be replaced. Thankfully, the process for testing memory has been simplified for users of later versions of Windows. Microsoft has built the Memory Diagnostics Tool into the operating system itself, so you don’t need to worry about downloads and bootable CDs. In the top right corner of the window, click View by and select Large Icons. Choose the option to restart now and check for problems. Be sure to save any open work before continuing, as this will cause your PC to restart. Your PC will restart and run the test automatically. Once the test is complete, your PC will restart once more and display your results. If your memory failed the diagnostic, you will need to replace the indicated memory module. 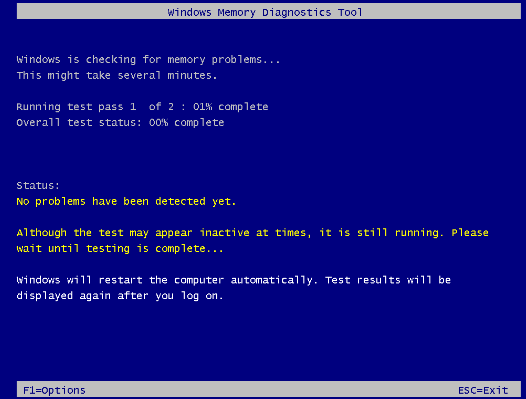 The process for running a memory test in Windows 8 is basically the same as in Windows 7. The only difference is how to get to your Control Panel to set up the test. Press the Windows Key. Type Control Panel, and press Enter. Under Administrative Tools, select Windows Memory Diagnostic.